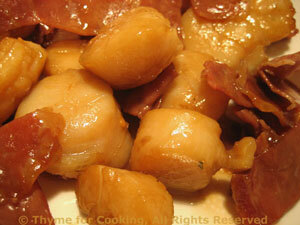 Thyme for Cooking's Main Courses: Chinese Scallops, Grilled Steaks. 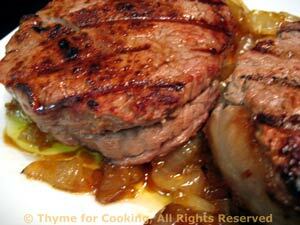 With a lovely piece of flavorful, tender filet mignon this is truly marvelous main course. But the savory-sweet onions will make even a lesser cut shine. Mix Worcestershire sauce, oil and brush on steaks. Set aside. Cut onion in half then into 1/4 inch (.65cm) think slices. Heat butter, oil in medium nonstick skillet over medium heat. 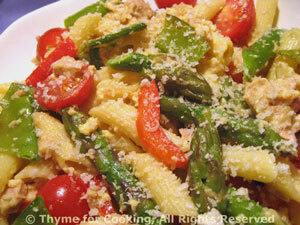 Add onions and sauté until browned, stirring frequently, about 25 minutes. You may have to turn the heat down to low after about 15 minutes. When onions are nicely browned add sugar, mustard, Worcestershire, and stir until well blended and sugar is melted. Set aside and keep warm. Cook steaks on barbecue grill until done to your liking.... about 3 minutes per side for medium rare. It depends on thickness of cut, heat of grill, etc. Check out this site for the 'thumb test'. Divide caramelized onions and place on 2 plates. Put steak on top and serve. 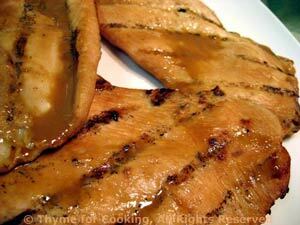 Note: Could be done under the broiler (grill) or quickly pan fried over high heat for about the same time. 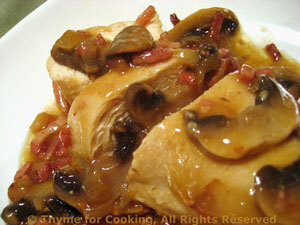 One cannot go wrong with mushrooms and bacon.... A bit decadent, perhaps, but life is for living. My bacon is very lean, so I have to sauté it in oil. Use it or not, as needed. Add bacon, onion, garlic, and sauté 5 minutes. Add mushrooms and sauté 5 minutes longer. Move onion/mushrooms to the sides of the pan. Add chicken breasts and brown lightly on both sides, about 7 minutes total. 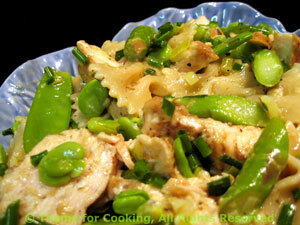 Add white wine, reduce heat to low, cover and simmer until chicken is done, 10 - 15 minutes longer. Remove chicken to a plate. Increase heat under skillet. Add cornstarch mixture to mushroom bacon sauce, stirring until thickened.